As we approach the public release of Android O, it seems like Android Nougat is now picking up pace in terms of adoption. Google has updated its distribution chart that shows share of various platform versions with data from a 7-day period ending August 8 and the new numbers suggest that Android Nougat is now present on 13.5 percent of active Android devices that checked into Google Play during the aforementioned period. Last month, the data from the Android distribution chart suggested that Android 7.0 Nougat was present on 10.6 percent of devices while the Android 7.1 Nougat version was present on 0.9 percent of total Android devices that checked into Google Play, taking the overall percentage to 11.5 percent. This time around, the Android 7.0 Nougat was found to be present on 12.3 percent devices while the Android 7.1 Nougat was noted to be on 1.2 percent of the overall devices that checked into Google Play during the time period under consideration. To note, the figures are gathered from devices visiting the Google Play app, which only supports Android 2.2 and above. The updated numbers confirm that Android 6.0 Marshmallow is now present on 32 percent of devices and continues to enjoy the largest share among all platform versions. While Android 5.0 Lollipop has a share of 7.4 percent in the updated chart, Android 5.1 Lollipop was found to be present on 21.8 percent of total devices. To recall, Android Lollipop was present on 30.1 percent of the devices on last month’s chart. Android KitKat, which was running on 17.1 percent of devices for last months, was found to be present on 16 percent of overall devices that checked into Google Play on the updated chart. 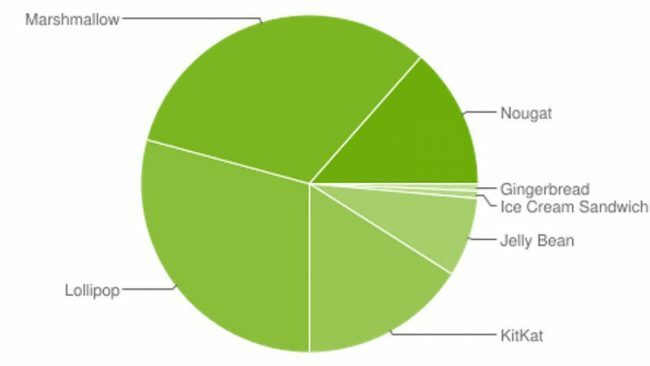 Android Jelly Beanhas a combined share of 7.6 percent, while both Android Ice Cream Sandwich (v4.0.3-4.0.4) and Android Gingerbread (v2.3.3-2.3.7), have a share of 0.7 percent each, just like last month. Google also updated its OpenGL version distribution numbers which has OpenGL 3.0 at 45.6 percent, and OpenGL version 2.0 came down to 37.6 percent. OpenGL version 3.1 is now present on 16.8 percent of the devices.